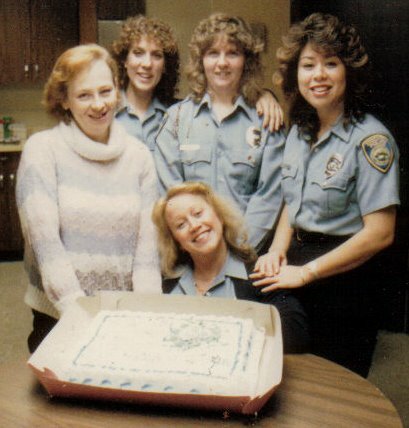 This picture was taken sometime in 1986 (my feeble mind forgets exactly when) when my dispatch team was being broken up due to seniority bids in the Command Center at the Stockton Police Department. For those who read regularly, my good friend Miz Cyn is the one on the left in the snazzy sweater (she was pregnant with her third child) and I would be the one in the middle with the, er, 80's hair. The others are Chris with her arm around my shoulder, Kathy to my right, and Dianne down by the cake. We were quite the team and I hated going to another shift and leaving these people behind. Matter of fact, it was the beginning of the end for my time at SPD. Just goes to show that the old adage of "if it ain't broke don't fix it" really rings true. Oh, and for the record, I thought I was FAT in this picture. Sigh ... to be that size now! It's amazing isn't when we look back at photos where we thought we looked fat, only to see that we weren't at all? oh i knew that was you when i first glanced at it. and i thought i was fat when i weighed 125! buggers! I remember this photograph. Funny how 25 years can make us look so different. Hairstyles and the like. I thought I was fat back then too. I wasn't either, just like you aren't in this picture. Sigh. I like your 1980s hair! I'll have to post my 1965 photo with my hair helmut. UGH. Why is it that some execs just can't keep their hands off a good thing? I guess it's a control thing. But I'm glad that you and Cyn are still good buds. I've always thought I was fat even when I wasn't. And when I was really fat? I thought I was ready for the side show. Weight. Hate it.